On July 13, 1983 the National Military Fish and Wildlife Association came into existence when the Constitution and Bylaws were accepted. The first President was Gene Stout. Other Board members were Vice President - Patricia Worthing, Secretary - Nancy Stehle, Office of the Assistant Secretary of the Navy, DC; At- Large Director (East) - Charles Peterson; At-Large Director (West) - Ron Dow, Point Magu NAS, CA; Program Chairman - Maj Joe Ward, HQ Air Force, Tyndall AFB, FL; and Nominations Committee At-Large Member - Marlo Acock, HQ Marine Corps, DC. The first official newsletter was put out in February 1984. The name Fish and Wildlife News (FAWN) was probably Jock Beall's (Fort Lewis, WA) brainstorm in 1984. The newsletter brought to a head the idea of an independent organization. There were those who thought the newsletter could be printed and mailed at installation expense, which would save the Association its greatest expense. However, it was decided that NMFWA would pay for paper, printing, and mailing to be above board and make a firm statement on the Association's independence. The first editorial group designed the newsletter masthead, and it has undergone a couple of quality improvements along the way. In June 1990 the FAWN began being published on recycled paper by editor, Rich LeClerc, NAS Indian Head, MD. Cost of publishing the newsletter forced the Association to come to grips with finances. Two means were debated, annual dues and meeting registration fees. Since a primary goal was to rapidly increase membership and there are inherent problems associated with collecting dues, it was decided to charge a registration fee at annual meetings/training sessions to pay for meetings and newsletters. The legality of using registration fees to support items other than the meeting was questioned. Ludlow Clark got a legal opinion supporting this system. At the Association's second meeting in November 1984 in New Orleans, LA, Tom Warren was elected Secretary/Treasurer (a change in the original Secretary title) to reflect the fiscal aspect of NMFWA. Membership was originally limited to those who had attended at least one meeting. In 1984 a rough membership application was devised. In 1987 a professional application was designed and printed. In 1987 the membership list was purged of inactive members using this new form for persons to register as members. The idea of NMFWA letterhead and envelopes was first discussed in 1983. In 1985 letterhead was purchased. Marsha Rogers, wife of Bill Rogers, Cherry Point MCAS, NC, designed the NMFWA logo (a duck and fish). The Association has been listed in the Conservation Directory (published by the National Wildlife Federation [NWF]) since 1984. The President is responsible for updating this listing of officers and Board members annually. The matter of resolutions was the focal point of the second meeting in 1984. After long and serious debate, the Association passed 3 resolutions regarding wildlife law enforcement, staffing at command levels, and the Sikes Act. President Stout sent these resolutions to Secretary of Defense, Caspar Weinberger. This created a controversy over where NMFWA resolutions should be sent. Some (primarily command members) felt they should be sent to the Defense Natural Resources Group, while others felt NMFWA should send its major actions to the highest levels as do other private organizations. Since then, both avenues have been used. Other resolutions passed by the Association the first few years dealt with trapping, non-toxic shot, implementation of the Sikes Act, natural resources enforcement training, and publicity for DoD natural resources programs. The resolution process became relatively established and is no longer controversial. Tables at the end of this report include all resolutions passed by the membership. The reauthorization of the Sikes Act in 1986 was the Association's most controversial action to date. Officially, NMFWA took stands as early as 1984 on matters included in the Sikes Act, such as protection from contracting out and equal status with other DoD natural resources managers (foresters, agronomists, and range managers). Officially, NMFWA decided against supporting this reauthorization when it was first introduced since DoD opposed the bill. Unofficially, the Sikes Act, with strong amendments, was passed primarily due to the efforts of individuals within NMFWA, notably Carrol Martin, Fort Pickett, VA, Stout, and Warren. Eventually, NMFWA came on line to support passage of the bill in spite of DoD opposition. During final stages of this political battle in 1986, there were some animosities created between some persons who worked at command levels and persons within the Association's leadership who were openly working to pass the bill. Some felt the Association was being used improperly, and others felt the Association should be more active in working for bill passage. NMFWA President Stout was quoted out of context in an article in Outdoor Life during the Sikes Act debate. This article was highly critical of the military's wildlife program, and this quote probably damaged NMFWA’s stature within the DoD community on a temporary basis. The bill passed in late 1986 even though it had to go through both the House and Senate Armed Services Committees. The bill has proven itself, and the action proved that NMFWA and its membership had considerable political muscle. President Warren spent considerable effort early in his term of office re- establishing lines of communication with command levels. His diplomacy and efforts to make NMFWA a mechanism to support both command and installation interests were milestones of his term in office. The matter of a directory for fish and wildlife professionals was resolved on a rather permanent basis shortly after the Association was formed. With help of Bob Wardwell, Armed Forces Pest Management Board (AFPMB), DC, NMFWA supported listing natural resources managers within DoD in the AFPMB Directory. Thus, Fish and Wildlife managers are now included in an official DoD directory, and this effort is external to NMFWA. An early concern of the Association was dissemination of job announcements within DoD. Warren was appointed chairman of a special committee to look into the matter in late 1983. He worked with Wardwell to get mailing labels from the above-mentioned directory to advertise jobs. He then informed members of a commercial natural resources job announcement service called The Nature People. Following this, Warren made a recommendation for members to use JOBSOURCE, which is a computerized search service endorsed by TWS and The American Fisheries Society (AFS). In 1990-91 many members utilized The FAWN to advertise job openings. 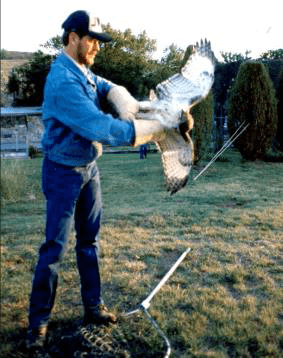 Currently, a wide variety of these and other means are used to promote USFWS jobs, but the matter of a single publication, like the USFWS green sheet, has never been implemented. 301. In June 1987 the number had risen to 351. By April 1988 newsletters were being sent to 422 persons, presumably all members. At the July 1988 meeting it was decided to purge this list of all members who did not renew via the new application form. In March 1989 there were 404 members, and by January 1990 there were 417 members. In January 1992 membership was 494, and it exceeded 600 by 1993 and over 700 by 1994. In the mid-1980s, Richard Griffiths, Army Environmental Hygiene Agency, MD, computerized the membership list. In 1987 President Warren established an Awards Committee under the chairmanship of Richard Griffiths. This committee was an outgrowth of an impressive awards effort with passage of the Sikes Act in 1986. NMFWA presented 12 plaques to conservation organizations and U.S. Senators and Congressmen who worked for passage of the bill. At the 1988 Association meeting the first Awards Banquet was held by the newly formed Awards Committee. Awards were presented to Stout for his efforts to form the Associ- ation; Warren for his leadership as President; and to persons listed at the end of this document. In addition, outgoing Board members were presented certificates for their service to the Association. Awards Chair Alan Dyck and his committee revamped the Awards process in 1991 to create three awards in separate categories to reduce the number of awards and create true competition. In 1992 the Board decided to create the NMFWA Presidential Award for outstanding leadership, commitment, and ethics by a DoD employee especially in the field of biopolitical action. Current and past Presidents determine awardees. At the 1995 annual meeting the first two of these awards were presented to Gene Stout and Junior Kerns. This Awards Program led to the first use of NMFWA news releases in 1988. Stout undertook the task of notifying Public Affairs Offices at installations where either award winners or officers worked as well as notifying, via news releases, various conservation organizations and publications of happenings at the 1988 Annual Meeting. This first effort resulted in 44 news releases being sent. News releases are now provided to award winners for their local media [Editor’s Note: Not sure when this was discontinued.]. In 1984 Stout conducted the first DoD-wide wildlife law enforcement training class at Fort Sill, OK. It was difficult for a single installation to support such an effort. Thus, in 1986 President Warren appointed Steve Emmons to chair a new wildlife law enforcement special committee. Under Emmons, NMFWA sponsored basic and advanced wildlife law enforcement courses at Fort Carson, CO in 1986 and 1987. Courses since then are listed at the end of this report. Almost every year this course produces more revenue than costs for the Association. Many, if not most, wardens throughout DoD have attended these courses. At the 1988 meeting, NMFWA requested assistance from DoD with basic natural resources law enforcement training. NMFWA intends to continue its efforts in advanced training. It should be noted that the 1977 survey indicated that military fish and wildlife managers considered wildlife law enforcement to be their second most serious problem (behind number of personnel), and a similar survey in 1984 indicated no change in this status. Thus, NMFWA has traditionally shown a great deal of interest in this area. A 1989 survey showed enforcement problems to drop to third place, perhaps reflecting Association activity in this area. NMFWA’s Constitution and Bylaws have been amended 6 times since passage in 1983. In November 1984 changes were made to create a Secretary/Treasurer and various means to collect and account for funds. In March 1986 they were changed to add one additional At-Large Director from both East and West regions as well as add the Newsletter Chairperson to the Board. In November 1986 many editorial changes were made as well as deleting Association requirement to “function within the Department of Defense and adhere to natural resources management policies promulgated by the Department of Defense (DoD).” The number of consecutive terms of office was also changed. In March 1990 major changes were made. Two Vice Presidents (East and West) replaced one, and 2 At-Large Directors were added to the Board. Elections were changed to be accomplished by mail prior to annual meetings. The first such election was held in 1991. The Nominations Committee was changed, and the Immediate Past President was made Chairperson. The resolutions process was formalized. Indemnification of the Board was removed. Other minor changes were made. In July 1992 the membership voted by mail to make several changes. These were to take effect at the 1993 annual meeting. A Vice President and a President-elect replaced the two regional Vice Presidents. A Membership Committee was also established as a standing committee. The President’s term was reduced to one one-year term. In 1993 the Bylaws were revised to upgrade Awards and Resolutions special committees to full committees and to create Law Enforcement, Poster, and Archives committees. Changes also included early announcement of election results, additional responsibilities for Directors, and a provision to allow mail ballots for Bylaws changes. The 1998 changes to the Bylaws included the following: Audit and Government Affairs were converted to standing committees with respective chairs appointed by the President. Directors would be elected on alternating years, thus allowing for continuity between elections; the President elect would assume the office of the President immediately upon expiration of the incumbents’ term. Additionally, the preamble was modified to clearly articulate professional and organizational objectives. Other changes have been discussed periodically by the membership, but have not been adopted. These include the topic of changing the organization name, dues (same problems as discussed in 1984), voting membership (a strong desire to keep voting status to those who actually have installation responsibilities as opposed to only other military lands), combining with other military land managers to form a natural resources association (a desire to keep the strong special interest emphasis on fish and wildlife), permanent ties with one conservation meeting such as the North American (desires to maintain flexibility and ties with regional meetings), and similar items. 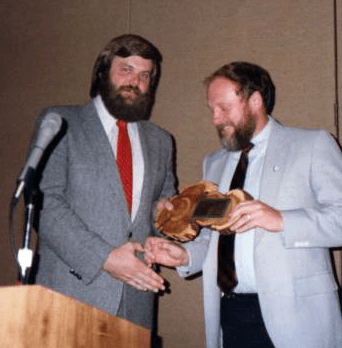 It should be noted that the March 1986 meeting in Reno, NV in conjunction with the North American Wildlife and Natural Resources Conference was a highlight for NMFWA. The Association had about 120 in attendance, which was, by far, the largest attendance of any group (including governmental agencies) represented at this most prestigious conference. Many feel that this meeting was the first time the Association was recognized by the conservation community as a viable conservation organization. It is safe to say that national credibility was attained in Reno in 1986. This credibility was greatly expanded by President Warren in 1987 when he either personally presented or arranged for presentation of 12 plaques to organizations and political figures that helped with the passage of the Sikes Act. These presentations were made in very public meetings, and the Association gained considerably in stature as we thanked our friends. Command support for NMFWA has, in general, been very strong. The Association would have had a very tough time coming into existence without such support. In spite of differences of opinion between installation and higher- level command positions at times, the Association has been supported from above. In fact, virtually every person at command levels in all branches that has fish and wildlife responsibilities are members of NMFWA and strongly support its efforts. Some strong early supporters of the Association at upper levels of command were Christina Ramsey - DOD, Ludlow Clark - Air Force, Don Bandel - Army, CPT Dennis Hargett - Air Force, Nancy Stehle - Navy, Marlo Acock - Marine Corps, and Maj Joe Ward - Air Force. Intermediate command level personnel have been extremely active in the Association as is evidenced by the list of officers and other NMFWA officials over the years. A specially designed lapel pin was distributed to attendees at the March 89 meeting in Washington DC. Under the leadership of Larry Adams, the Association increased its financial stability. It was notable that after 1989 annual meeting costs were paid, the Association still had over $3,000. Even by January 1990 there was over $1,800 in the bank. In June 1991 the balance was $3,450. The ties with the North American conference were strengthened in 1989 when it was decided to have a joint registration fee for both meetings beginning in 1990. Even though the Association may occasionally meet with other groups (especially when the North American is out of country), there are obvious advantages to ties with this prestigious conference. A list of annual meeting sites is included at the end of this report. By the 1992 meeting with the North American most of the bugs had been worked out of the joint meeting. President Adams expressed concern to the USFWS over the Service’s efforts to eliminate commissions as U.S. Deputy Game Wardens for Defense personnel. In late 1989 and early 1990 efforts were underway by DoD to produce a MOA to allow DoD to issue these commissions under Interior guidelines. A draft document was available in 1991, but it has serious deficiencies. In November 1991 NMFWA was invited to participate in negotiations regarding this MOA. A significantly improved version was prepared in early 1992 due to this input. This effort died at DoD, largely due to a lack of interest at that level. The 4 regional directors spent considerable effort to repeat a survey of installations that provided status information on fish and wildlife programs on DoD lands. The survey was modified from a 1977 and 1984 effort. It was presented at the 1990 meeting in Denver.